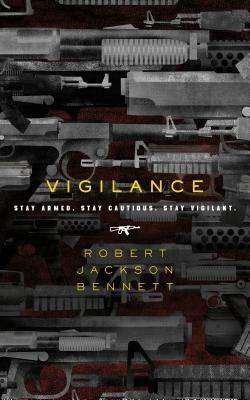 Thanks to Tor.com Publishing and the author for an advanced reading copy of Vigilance in exchange for an honest review. Receiving this ARC did not influence my thoughts or opinions on the work. Vigilance is part The Purge and part (and I can’t believe I’m saying this, and my apologies to RBJ) Hunger Games. Shooters are thrown into hand-picked environments and it is kill or be killed, all for the sake of teaching American citizens to stand up and defend. Good news is: you survive, and you get a $h1tload of cash money. Bad news is: when you die, there is no 1-Up. Best news is: your heroism can be broadcast nationwide for all to see. Holy Forking Shirtballs, this read… it ramps up from the very beginning and never lets off the throttle. The scariest part about this novella is that, even though it doesn’t take itself too seriously, it sends a message that we all need to hear. We have to stop being a nation of fear and cowardice, and become one that stands up to our enemies within and without. We have to be… vigilant. RBJ is quickly becoming one of my favorite writers, having just finished his novel Foundryside recently. He has a way of pulling you into his world, giving you some popcorn, Raisinets, and a soda, and being polite enough to put away his cell phone so you can enjoy the show. While Vigilance is a definite sidestep from his fantasy loins, RBJ quickly shows that he is more than a one trick pony. All in all, if we aren’t careful enough, Bennett’s American could become the status quo. And trust me, plenty of people will be tuning in. Holy forkin shirtballs is right. I needed a puppy after reading this..